Prostate health is something that affects every part of a man's life. If your doctor recommends that you start taking a natural product to help support the health of your prostate, or if you are already taking one, get the product with all of these targeted ingredients in one unique and comprehensive formula. Phytosterols (standardized to 45% beta-sitosterols) - Beta-sitosterol is one of many sterols that come from plants (phytosterols) and have a structure like the cholesterol produced in the body. You can find phytosterols in many plants and thus in foods such as rice bran, wheat germ, corn oils, soybeans, and peanuts. Beta-sitosterol is also available as a dietary supplement. Turmeric Extract (standardized to 95% curcuminoids) - Turmeric, a shrub related to ginger, is grown throughout India, other parts of Asia, and Africa. Known for its warm, bitter taste and golden color, turmeric is commonly used in fabric dyes and foods such as curry powders, mustards, and cheeses. Boswellia Extract (Standardized to 75% boswellic acids) - Boswellia is a large branching tree native to India, Northern Africa, and the Middle East. The trunk is tapped for its resin, which is purified and used in herbal preparations. Saw Palmetto Extract (Standardized to 45% total fatty acids) - Saw palmetto is a palm-like plant with berries. The berries were a staple food and medicine for the Native Americans of the southeastern United States. In the early 1900s, men used the berries to support urinary tract health and healthy sperm production levels. Pygeum Bark - Pygeum comes from the bark of the special evergreen tree called Prunus africana that grows in mountainous regions of Sub-Saharan Africa. The herb might have been known among natives of southern Africa — having used it to support the bladder and urinary tract — as early as the 1700s. Zinc - Researchers have uncovered data revealing that the trace mineral zinc plays an active role in maintaining prostate health. In fact, prostate cells accumulate more zinc than cells in any other human tissue. 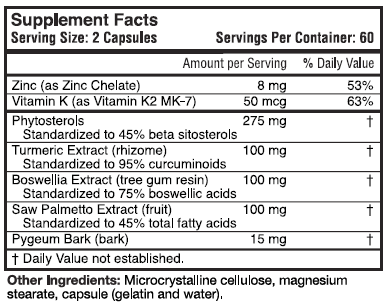 Vitamin K2 - Vitamin K2, particularly menaquinone-7 (MK-7), has been the subject of much research because it stays active in your body longer, so you are able to benefit from much lower levels. Its biological role is to help move calcium into the proper areas in your body, such as your bones and teeth. It also plays a role in removing calcium from areas where it shouldn't be, such as in your arteries and soft tissues. We're so sure about the effectiveness of the RHP® Prostate Support Formula, that we offer a 90-day money-back guarantee on your initial order. A bottle containing 120 capsules is now $32.20. 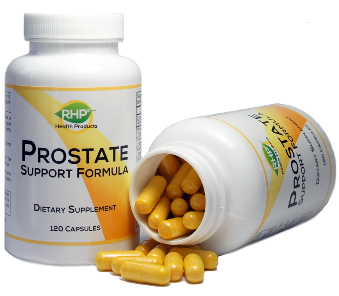 Order your RHP® Prostate Support Formula today and experience the results for yourself! Order the RHP® Prostate Support Formula Now!